PHILADELPHIA - Dec. 11, 2014 - PRLog -- Fields of Gold, Baseball's Best Glove Work, the new book by Stat Geek Baseball, is now published and available for sale at your favorite online and brick and mortar retailers. Distributed nationally by Ingram with current sales at Amazon.com and BN.com, Fields of Gold focuses on baseball history's best fielders. It is a companion edition to Baseballevaluation.com's Stat Geek Baseball, the Best Ever Book, which covers the topics of batting and pitching. Fields of Gold, Baseball's Best Glove Work traces the best fielders in the history of professional baseball from the beginning of the game in 1871 through today. Presented by Stat Geek Baseball and baseballevaluation.com, the book ranks each position player who played five hundred games and describes the Top Ten players who patrolled the diamond at each position. Also included is a ranking of all Hall of Fame players by Field Value, the Stat Geek Baseball metric for fielding, plus a ranking list for the Top Fielders for every current team, plus a whole lot more. If you've got a baseball fan in your family or are one yourself, then this study of baseball's best fielders through the history of the game may just be right for you. 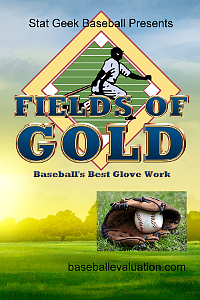 Written in a conversational tone, but with lots of stats and rankings, Fields of Gold has something to engage every baseball fan, from the novice to the professional to the sabermetric fanatic.